White hand towels 16x27 in economy grade, for any business looking for affordable hand towels in medium size, made of 100% cotton. super white Economy towels. If you're a pet groomer, you’re busy serving your four-legged, furry clients. You don’t have any time to worry about the effectiveness of your hand towels. If you operate another type of company that serves the public, you're just as busy, too. At Towel Super Center, we offer 100 percent cotton grooming hand towels in a generous 16-inch by 27-inch size. These hand towels are just right for all your pet grooming needs, and they’re priced low enough for you to get dozens of them. Never be without a hand towel when you most need it. Trust Towel Super Center to supply you with the best hand towels available. Uniformity: They will come as a group, which means they'll age as a group. Rather than having towels that are mismatched or of different ages, your wholesale grooming hand towels will all perform at expected levels based on when you purchased them. This provides a sense of consistency that makes it easier to get jobs finished. Absorbent: Our towels wick away moisture evenly. You may even discover you use fewer of these grooming hand towels than you did of your previous variety. Cotton is amazingly thirsty and can soak up many times its weight in liquid. Sized Right: These towels will be the right size for what you need. At 16" by 27", they're the only grooming hand towels you'll want to make pets feel pampered and assure pet parents feel they got their money's worth. Reusable: They will constantly clean up neatly. As long as you regularly launder your white grooming hand towels and use a bleach alternative product to keep them gleaming, you'll always have good-looking towels at the ready. Ready to impress your four-footed guests and their human companions? Order as many units of wholesale grooming hand towels as you need. Why choose 100 percent cotton fibers for your grooming hand towels? There are numerous reasons. Cotton is a very absorbent material. This means it will take less time to towel-dry one of the dogs, cats or exotic pets you’re grooming. The faster the dry-time, the more pets you can see in each day. In addition, cotton is built to last. The fibers hold together tightly thanks to a strong weave. You can wash them over and over, and they won’t fall apart. This helps you avoid the embarrassment of having to use raggedy hand towels in front of your pet parents. Finally, cotton is extremely soft. Some pets, like people, are sensitive to touch. By drying them with a gentle-feeling hand towel, you’ll be making the experience much more pleasant and soothing. 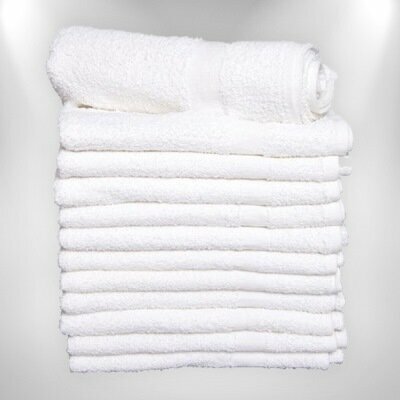 Our white cotton hand towels are offered at bulk pricing rates. Simply choose how many dozens of these hand towels you need for your grooming business, and we’ll deliver them right to your facility. It’s that simple to get the best cotton hand towels!